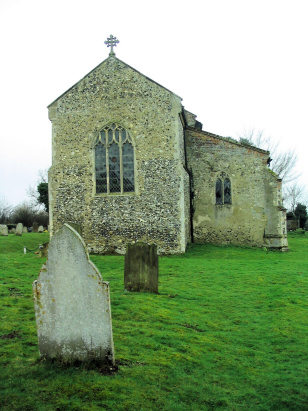 The parish of Easton sits west of Norwich barely 4 miles west of the city and adjacent to the busy A47 east-west road. The village once blighted by this main road is thankfully now bypassed by Norwich's Southern bypass. The parish, one a village in its own right, is now almost engulfed by the expanding city and forms part of the suburbs. The collage stands on the higher ground traversed by the A47 and above the marshy valley of the River Yare. The village is known for its Agricultural College which has trained many thousands in the skills that where dominant here in the past. St Peter's church stands in a strange setting as behind its graveyard hedge runs the traffic of the A47, the church is thus isolated from the village its serves. 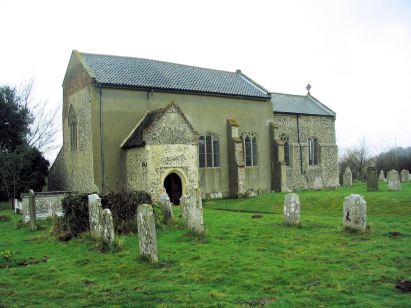 The fabric of the church is a strange mixture with Perpendicular dominant as befits a Norfolk church but traces that hint at an older building of Norman and possibly earlier age. There was formerly a tower to the west of the building but this fell in 1778 leaving the present nave and chancel. These records were prepared from Microfiche 6 in the collection of the Norfolk Record Office. This film was produced in the late 1980s and it shows, the images being faded and lacking crispness and clarity. However the register must have been well preserved because despite the poor filming the entries were in the main fairly legible. The usual caveat about handwriting stands but on the whole this was a straightforward transcript and it is hoped that few errors have crept in to its compilation.